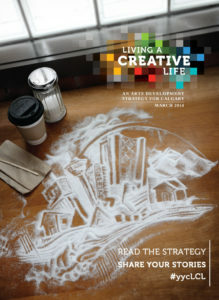 Living a Creative Life: An Arts Development Strategy for Calgary is pleased to share its Success Indicator Baseline Report for 2014. Living a Creative Life includes success indicators for each focus area so that progress towards the strategy’s outcomes can be tracked. These success indicators are systems-level measurements that will be evaluated annually, and the Success Indicator Baseline Report provides baseline data for each indicator, using the most complete information available at the time. Future success indicator reports will compare their measurements against these baselines. We would also like to thank Alberta College of Art + Design, Mount Royal University, Southern Alberta Institute of Technology, Statistics Canada, Stone-Olafson, The City of Calgary, everyone who participated in the Arts Professionals Survey and all the arts organizations that provided data on their facilities and emerging artist programs. Questions about the success indicator reports can be directed to emiko.muraki@calgaryartsdevelopment.com.